About every ten years, Convextion is shaking up the world. It began in 1995 when Sean Deason’s Matrix Records from Detroit launched with the debut twelve from the electronic artist from Dallas. The follow-up on the same label and EPs on Tektite and Down Low Music brought the Texan Gerard Hanson to the awareness of the public who appreciated deeper, dub-infected techno. 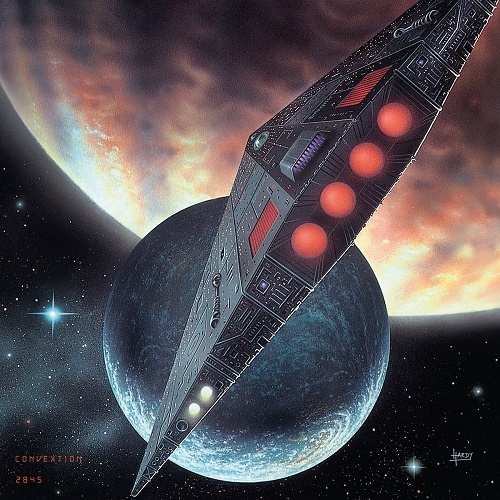 Convextion’s brilliant debut album in 2006 created immense but well-earned hype but also left a strange aftertaste because of Down Low Music’s decision to do numerous represses of what initially was meant to be a limited edition. Probably it was the biggest success for Down Low, shortly before the label went down the drain. The wait for the next Convextion long player lasted almost ten years and without any preceding promo drumming the album released on Mojuba sublabel a.r.t.less has been immediately praised both for the music and the (sleeve) design. It’s a dreamer’s bright-minded outbound journey to the remote ends of the Universe. When thinking about the 2006 album’s steel-brushed dubs and crusty synth passages,”2845″ with its delicate sound picture may appear too predictable and too safe but no one should say an author’s studio mood should remain unchanged over the years. Ambient intro of the ultra-long opener “New Horizon” is dubby IDM what one can expect from Convextion, matched by “Distant Transmission” that goes closer Detroit techno’s foundations. The next three tunes are my favourites: firstly “Saline Moon”, a rolling piece with notes of Latin percussion that could easily find a place in the 430 West catalogue and recalls Matti Turunen’s “Elokuu”. Then lush pads and bass harmonies are carrying “Tidal Friction” and another stellar tune is “Sea And Satellite” that obtains energy from the Southern oceanic surface and makes me think about John Beltran’s nineties output. The opening tones of “Exploration” promise suspense with hi-hats and stronger percussion that soon will cohabitate with Convextion’s trademark chords and for the end, “Flybay” ups the tempo in a company of clicks and cuts. Although I don’t think it’s the album of the year, “2845” is a perfectionist’s work full of shimmering lights and strong belief that over 800 years later we – or creatures who have succeeded us – live in peace and harmony in the cosmic vastness.